The "Veep" regular and "SNL" writer come together for a Comedy Central series about commercial producers on the ups — and looking to bring Detroit with them. It’s evident in tone and topics the Comedy Central series isn’t trying to be a funny version of “Mad Men,” but Sam Richardson and Tim Robinson’s new show about best friends and co-workers aiming to rebuild a fallen advertisement firm in Detroit does provide a fresh take on the modern lives of ad men — goofy, encouraging, and very funny ad men, as opposed to self-serious, heavy drinking ad men. Richardson and Robinson play Sam and Tim, respectively, two longtime best friends who work together at Cramblin Advertising, a company started by Tim’s father. While Tim Sr. built the firm into a national competitor, snagging big clients for wide-reaching spots, the business fell into disrepair when the founder lost his mind and had to be committed to psychiatric care. His son and his son’s best friend took over, but failed to secure their former clients and good faith of their employees in the transition. Now Sam and Tim make local ads with catchy jingles; the kind where a bathtub salesman dons a crown and proclaims himself “The Hot Tub King of Detroit,” or an owner of a sporting goods store hawks his kayaking equipment with the catchphrase, “You’ll be up a creek with a paddle.” The partners have fun with it, and the show even more so. Watching Sam and Tim struggle to come up with a pitch worthy of Chrysler during the pilot is a treat, and not only because they’re high on expired diet pills. 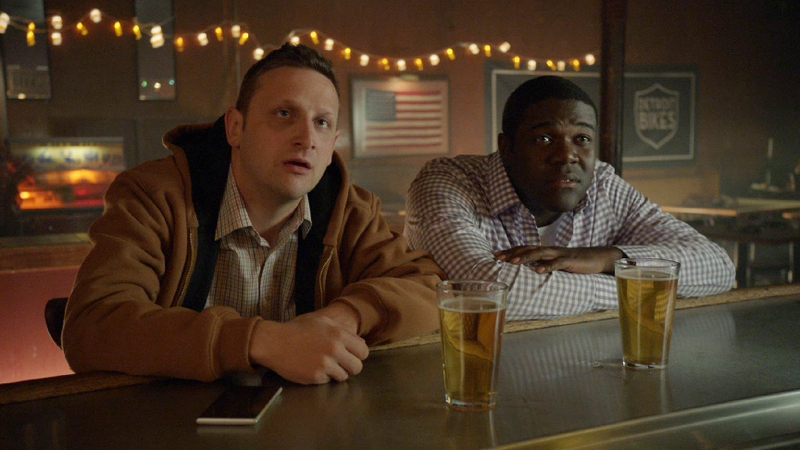 “Detroiters” sports a lot of jokes that go against the grain, so when Sam makes an awful pun, Tim takes a beat — astounded — and then encourages him to go into stand-up rather than tear him to pieces for embarrassing them in front of a client. There’s an innocence and purity to their belief in themselves and each other that makes the (seemingly improvised) sequences endearing. Similar to the line-o-rama riffs inherent of Judd Apatow comedies, Sam and Tim will construct scenes around a funny idea — a security guard pitching inane ad ideas, or a montage of the men trying to break a window with office supplies — and fill it with physical comedy and quick quips. Some feel a bit too dependent on making magic in the moment, rather than building off solid jokes in the script, but the genial attitudes usually carry more weight than any stale bits. Richardson and Robinson — both of whom were raised in the Detroit area — aren’t here to satirize their old stomping grounds or kick it while its down. They’re all about building it back up. Just as Sam and Tim want to return their firm to its former glory, the show consciously highlights what modern-day Detroit has to offer. The show casually incorporates scenic locations around the Motor City, from landmarks like the Ambassador Bridge to local parks to the best friends’ brick homes. Never forced or blunt, the two keep an ear toward comedy and an eye on their favored town. Through three episodes, there’s plenty of time left for “Detroiters” to define itself more fully. Like in most comedies just starting out, the series is eagerly experimenting with formula to find its strongest voice. The first episode features executive producer Jason Sudekis in an onscreen guest spot. The second defines their motivations moving forward. The third focuses on one-off situational humor. But Richardson and Robinson’s laid back approach to rolling out comedy — and especially the former’s addictively amiable nature — makes for consistent chuckles that can develop into hearty guffaws. It’s a soft sell you won’t regret buying the next morning, and one that could pay off even bigger in weeks to come. “Detroiters” premieres Tuesday, February 7 at 10:30 p.m. on Comedy Central.